Well, trust the man who reformats and reinterprets Lovecraft himself for the 21st Century to put a truly unique spin on From Beyond! It’s all there in the title of your story, Deresonator: a machine to counter the effects of Tillinghast’s original contraption. I especially enjoyed your narrator’s voice; he’s essentially an old-school grifter. So, do you come by this voice honestly? Any criminal history in your family? No criminal history as far as I’m aware although there are an awful lot of pastors and preachers in my family tree and they employ similar showman-like qualities as your average flim-flam man so perhaps I’ve just hit on that racial memory of patter and rhetoric which both helps me as a performer and gave me a fun voice for our hapless narrator in this story. It’s safe to say you’ve had to steep yourself in Howard (the Man, the Myth, the Mythos) in order to do what you do for Ask Lovecraft. Also, you’re one of the newer writers in this anthology. Have you found that playing a writer on TV has pushed you towards writing? More seriously, is Howie’s phantom hand gently pressed to your writing arm(s)? Is this like a ‘Patrick Swayze/Demi Moore in Ghost’ thing going on? Be honest. We can take it. Oh man, now I really want to find a way to film or photograph that image so everyone has to experience the horror along with me. I wonder how much Unchained Melody costs these days? Oops, got distracted there. Funnily enough, reading Lovecraft’s fiction and his letters did not in any way give me any sort of writing itch. In truth, I blame the fact that Ask Lovecraft has widened the number of writers I now know and when you spend time with those people, you’re bound to get infected with something. I’m just lucky that this time, I only came away with a mild case of literary inspiration and there are creams for that. 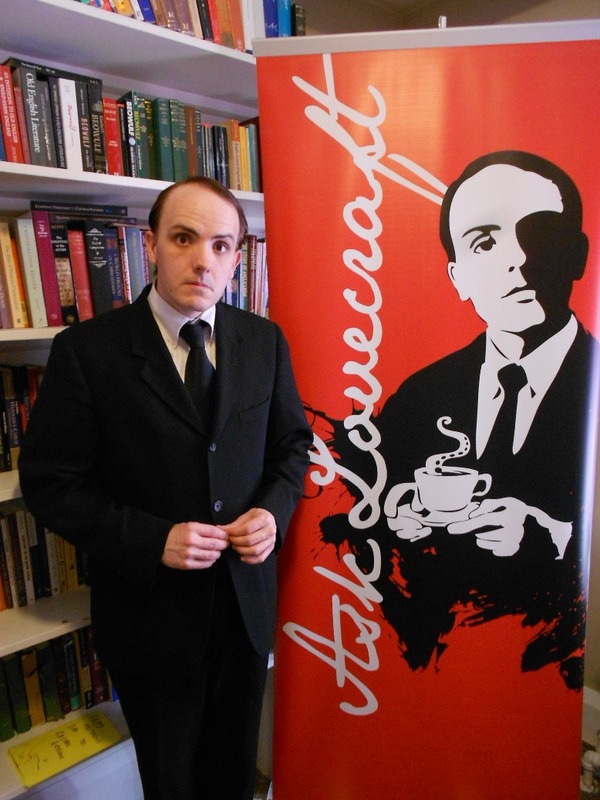 You’re taking Ask Lovecraft on a bit of a festival circuit in 2015. Where will you be seen, and when? Do you have a favourite aspect of live performance? This year will see me at Cthulhucon in Portland, Oregon this April and then back in Providence for NecronomiCon in August. Live performances are really my favourite part of this whole shebang. My background is in stage acting and while I don’t really work off of a script for my live shows, that energy and immediate feedback one gets from having an audience right in front of you is still so gratifying. I also love being kept on my toes and having to come up with answers for questions on the spot. For the web-series, I mull and I ponder questions and it can take me forever to hone what I think is an acceptable reply but when you’re staring face to face with your inquisitor, you really have to think fast. It’s a completely different part of my brain, almost more muscle memory and reflex than conscious thought and I can’t get enough of it. This entry was posted by the Face on 03/21/2015 at 1:14 PM, and is filed under New Releases, Promotions. Follow any responses to this post through RSS 2.0.You can leave a response or trackback from your own site. MMP Books and More in the New Lovecraftian Story Bundle!